19447 La Serena Dr, Estero, FL.| MLS# 218056062 | Southwest Florida Residential Real Estate for Sale. 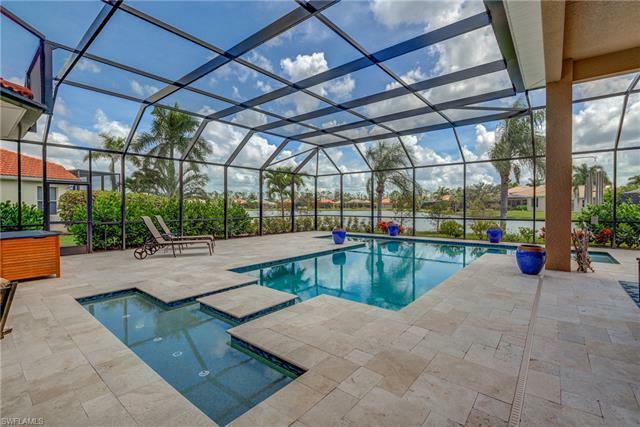 Enjoy beautiful sunrises over the lake from the lanai of this highly upgraded âDiplomatâ home by Toll Brothers. An exquisite new pool and spa complete with over 1900 sq ft. of travertine deck was added in 2017 offering one of the nicest outdoor living areas in Belle Lago!!! Inside you will appreciate the 5 bedrooms and 6 bathrooms featuring stunning new oversize porcelain and wood floors as well as new carpet in the second floor bedrooms. The master suite features over 600 sq ft of wide plank European oak. Designer features such as plantation shutters, decorative stone in niches, new lighting fixtures, designer paint and crown moldings can be found throughout this fabulous home. Belle Lago residents have access to membership at neighboring Estero Country Club, offering golf, tennis and social opportunities and direct golf cart access through a private gate. All residents enjoy privileges to the Belle Lago Clubhouse, with beach entry pool, spa, fitness center, social room, billiards, tennis, bocce, pickle Ball and basketball. Conveniently located just minutes from FGCU, Airport, area malls, dining and a short drive to area beaches. Owner is licensed Florida RE agent.